Conner awakens and sees the world devastated. Superman's charred corpse shudders in the wind. After all the horrors unleashed during the Reign of Doomsdays, Superboy it seems has survived and the Justice League have awarded him an exploration mission for down time and allowed his friend Psionic Lad to join him. They arrive outside a derelict ship in space and Sujan uses his powers to detect life. Two life forms are on board, alive but not 'active'. Conner's vision powers cannot penetrate the hull so they smash their way in. Conner searches everywhere, the world seems completely dead. One heartbeat whispers to him and Superboy races to find his half cousin Lori. She is angry, terrified and disgusted with her former friend. She reveals it was Conner that killed everyone, destroyed Smallville and hunted down survivors. A bewildered Conner has no time to retaliate as his former Teen Titan colleagues have formed the New Titans to destroy him. Searching the ship Conner and Sujan find a HR Giger inspired interior and search desperately for the two lifeforms. As they get closer Sujan realizes the two minds he can read are one and as they open a sealed hatch they discover a survivor in a vegetative state with something attached to his chest. The New Titans (Red Robin, Elongated Lass, Hawklad and Negative Boy) are all ready to capture their former friend. 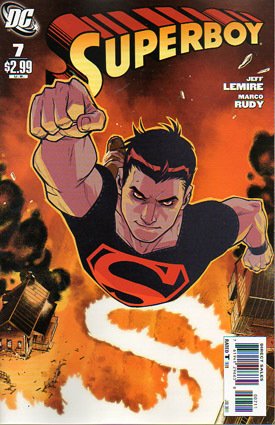 Superboy destroyed everything and Tim will stop at nothing to kill Conner, in revenge for killing Bruce! Tim even injected himself with Bane venom and Hourman's Miraclo so he could take on Conner himself. Superboy won't fight back and instead begs for mercy. This enrages Tim, as Cassie had done the same before Conner killed her. Red Robin's upper hand does not last as he is blindsided by a laser blast that cuts through him like butter. Enter Simon Valentine in an adapted Luthor Battlesuit. The New Titans all promptly die at Simon's hand and a horrified Conner begs his friend to stop. Simon is bewildered, he is only completing Conner's master plan. Simon smiles as he vaporizes Lori pointing out that Luthor's and Valentine's are destined to destroy and rule. What looks like a Black Mercy is wrapped around the spaceman and Superboy, against Sujan's advice, tries to pull it off the survivor. A ghostly projection of Martha Kent appears to Conner and just as he seeks comfort from her, Lex appears. Lex smiles that he is finally proud of his boy. The Mercy is now wrapped around Conner and Sujan is desperately trying to reach out to Conner's mind to pull him out of his dream state. The Mercy takes on the role of Lex and Sujan the role of Martha both pulling at Superboy's mind, one to release him the other to entrap. Not knowing Conner's love for Martha when the Mercy/Lex instructs him to murder her it breaks the control over his mental state and Conner is free. Later back on Earth, Sujan and Conner visit John in the Ironworks and discover the plant that tried to take over Conner was in fact a Red Mercy, a variation on the Black Mercy that Mongul had once used on Superman to unleash his greatest wishes. Perhaps the Red Mercy had the opposite effect, but Conner is fearful as the dreams he experienced were so real. Thankfully the ship that was full of Red Mercies was captured and brought to the Ironworks by Conner but John reveals another shock to Conner. The trajectory of the ship meant it was specifically delivering the Mercies to Smallville! Story - 4: A nice twist on the story 'For The Man Who Has Everything' showing the polar opposite in every way as Conner experiences what his life would have been like if he had succumbed to his Luthor bloodline. The only negative thing for me was the fact we have a variation in the Mercies. In itself that's not a big deal but when you think Geoff Johns just got done reintroducing the spectrum of Kryptonite not to mention the Lanterns, creating yet more colorful entities seems like a tired formula. Very disappointed that this issue relates in no way to the previous one but I'm glad that the storyline for Conner is moving swiftly forward. Art - 3: The artwork was incredibly hard to deal with as a reader. Flip flopping like a fish out of water worked for the writing because the storyline evolved but in terms of art it really doesn't work. Because you really don't know where to look. I get the Judgement Day color hues but they really over saturate the art. Cover Art - 5: This title, aside from Birds of Prey, has sported some of the best that DC has offered in a long time. This is an exceptionally good cover touching on Conner's dark side, showing he is a force to be reckoned with. Kershl has delivered a stunning cover!